Here's another 'Tangled Web' story and one of my favorites from the series. Warning for a few references to suicide. The story begins with #5 of the series. It opens with Stella Pavlov, the daughter of a gangster, kidnapped by his rivals. Her father sends the Rhino to rescue her. She asks who he is. 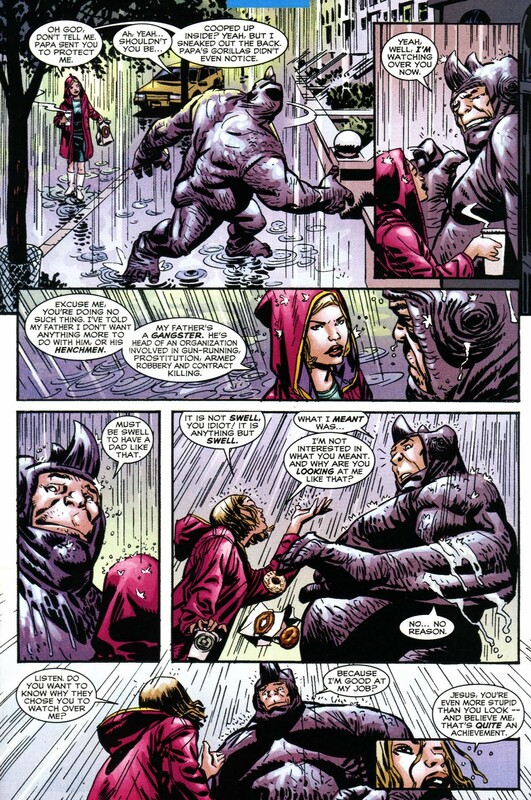 Rhino attempts to go after Spider-Man, but he is outsmarted by the webslinger and humiliated in front of the media. After Rhino escapes from prison, he meets up with the scientist who grafted on his hide. We see the day in the life of the Rhino and it's miserable. He lives in the basement so he won't fall through the floors and he has pulleys to pull himself out of bed. Stella's fiance, Romeo, comes to him with a job offer. Rhino turns it down but takes it when he finds out it's looking after Stella. Depressed at how meaningless his life has become, he considers suicide. Then he has an idea. The doctor starts it up. Rhino bites down hard. 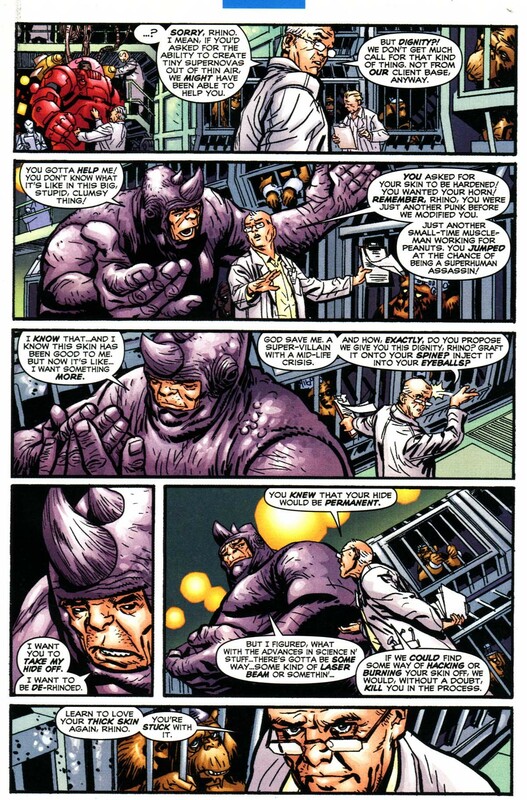 The doctor is attempting to test Rhino's intelligence to see how he can maneuver himself out of a maze. The doctor tells him to use his head, to which Rhino responds by barreling through the maze with his horn. As he becomes smarter, Stella starts to warm up to the Rhino. 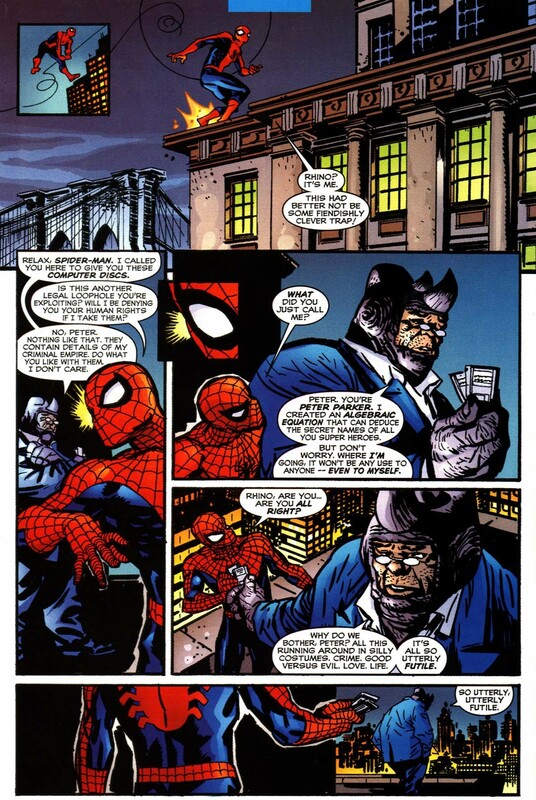 Jealous, Romeo leaves an anonymous tip for Spider-Man about his whereabouts and leads Rhino into a trap. 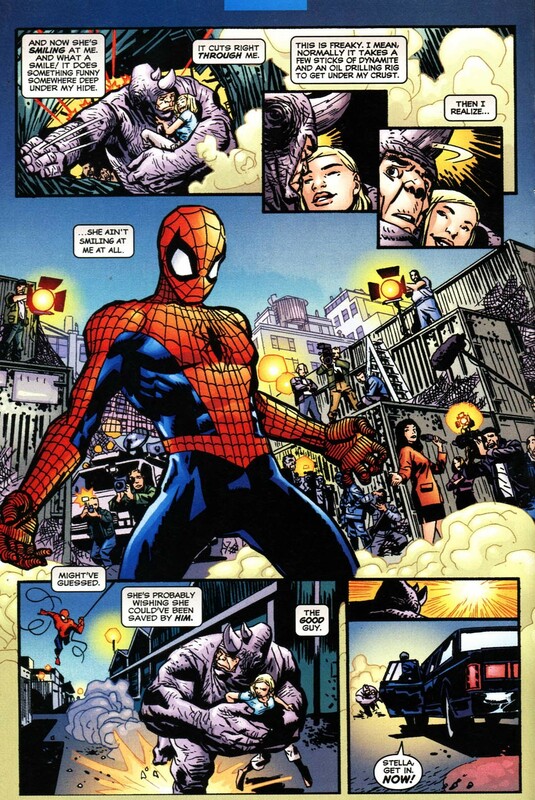 During his encounter with the webslinger, however, Rhino manages to outsmart and defeat him. Eventually, Stella chooses the Rhino over Romeo. The doctor's monkey, it turns out, has committed suicide. The doctor believes that the chimp became too intelligent for his own good and lost interest in everything. Rhino is not concerned; "I can't see the problem. I mean... how can one be too intelligent?" Once again, the Rhino considers ending his life when he thinks back on his operation. Romeo and Stella have married, with Romeo taking over Stella's father's organization. 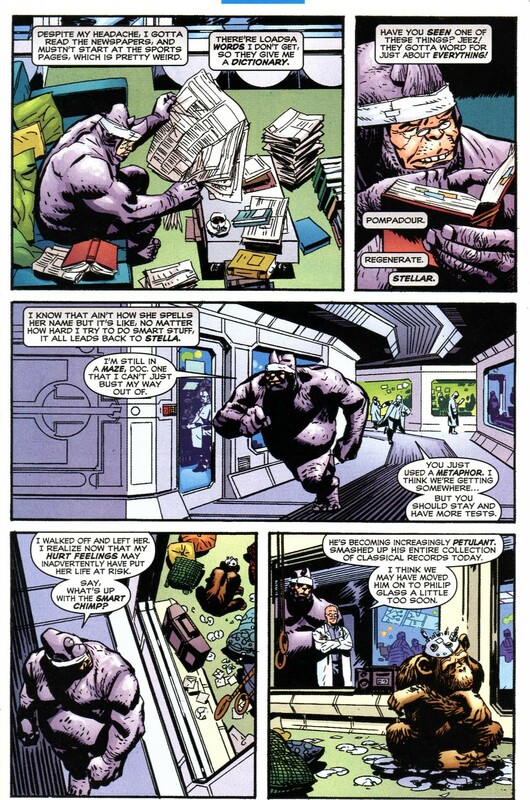 The Rhino crashes into one of his meetings. Something catches his attention, however. A book written by "William Shake-something". It reminds him of something that he can't recall. Then he throws it aside and remembers who he is. I guess sometimes what they say is true: "Ignorance is bliss." (b) Did he try to remove his hide, or at least create a working theory for it's safe removal? "Rhino? Isn't he a supervillain? He must be up to something. Let him in, but tell Ben to be ready in case he gets angry and attacks." "Rhino? That dolt? What, does he need help working out what the X sign on a calculator means? BWAHAHAHA! Hang up and continue massaging my throbbing, veiny scalp." 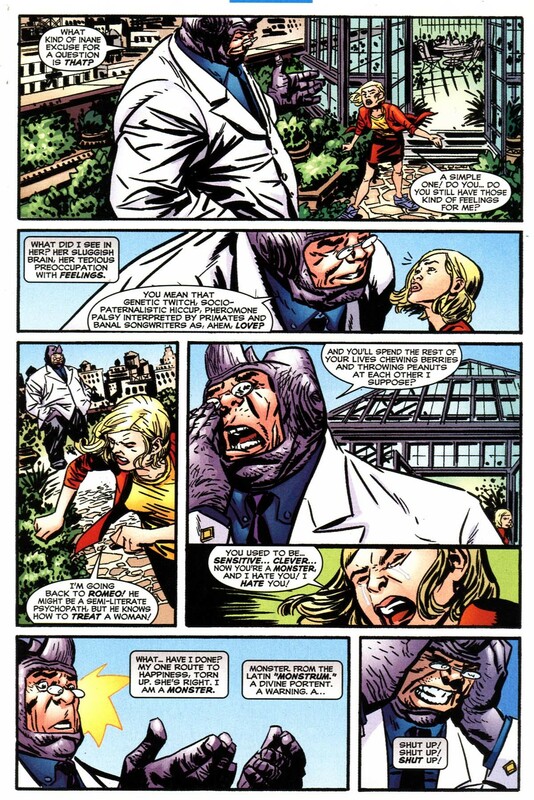 Was there any reference to the previous time he underwent procedures to become super-intelligent, back during Ka-Zar's ongoing series? Also, Rhino's supposed to be Russian or something, right? How come he always talks and acts like someone born and bred here? 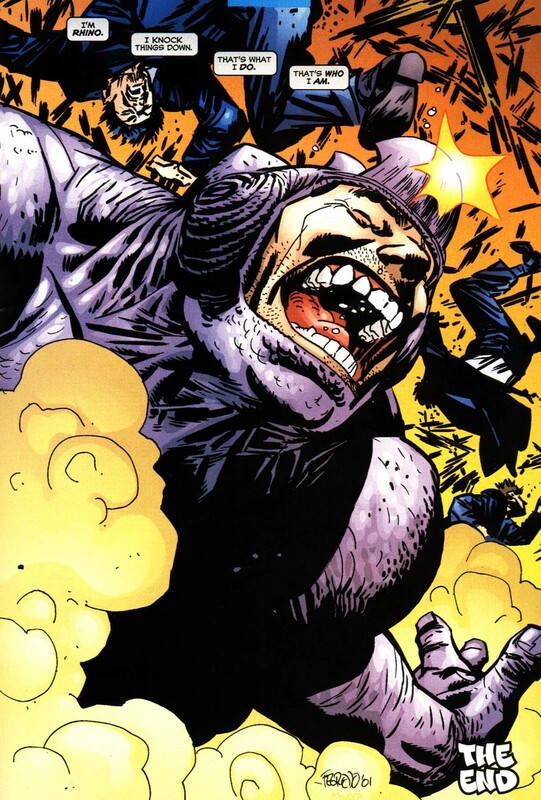 Marvel seemed to forget the Rhino was Russian for a while. Maybe when he became more of a Hulk villain? ...and he was really good at learning languages. I've met adults who have learned to speak without an accent. It took them a lot of study of native speakers but they were capable of learning. I have never met someone who learned to speak english as a kid who had an accent. The accent pretty much disappeared in childhood. This was a Simpsons episode. I know both were influenced by Flowers for Algernon but this reminds me of Homer becoming intelligent and subsequently putting an end to it by sticking a crayon into his brain. 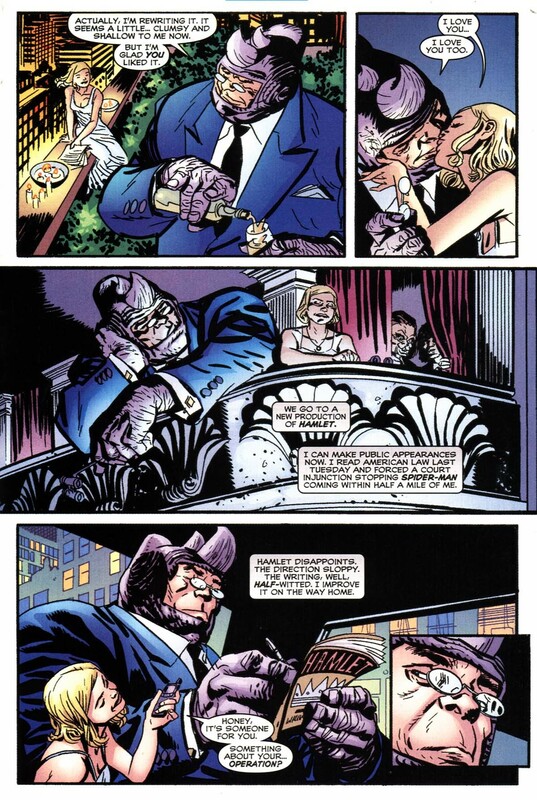 With the other story as a primer, this seems more like, "Rhino tries to change himself again for a woman." 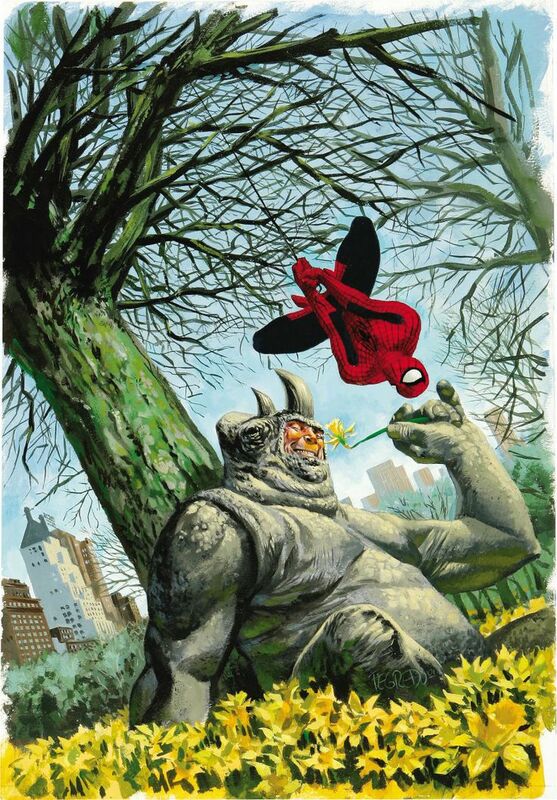 I can picture what you're talking about, but I don't see it; unlike the case of the blonde damsel-in-distress, Rhino doesn't seem to express any sort of longing towards Squirrel Girl, romantic or otherwise. She just catches him offguard by honestly trying to empathize with his personal problems, and in this way seeing something in him that no one cared to—it's all about him, not about her; she's less an object of desire, which would be a reason to change, than a psychologist who acts as catalyst to self-actualization. 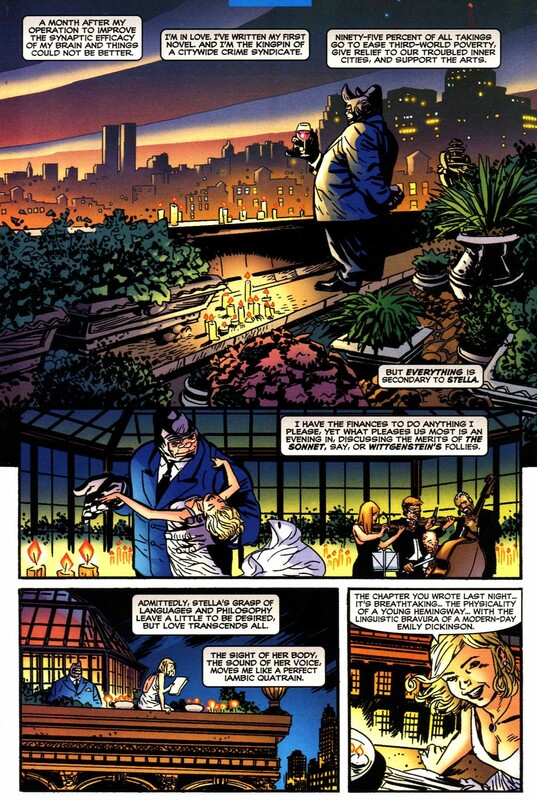 Which is kind of a recurring theme in Doreen's crimefighting approach, in Ryan North's run. 'course, it could have been worse. He could have teamed up with a VR monkey and called every telephone in the world simultaneously. 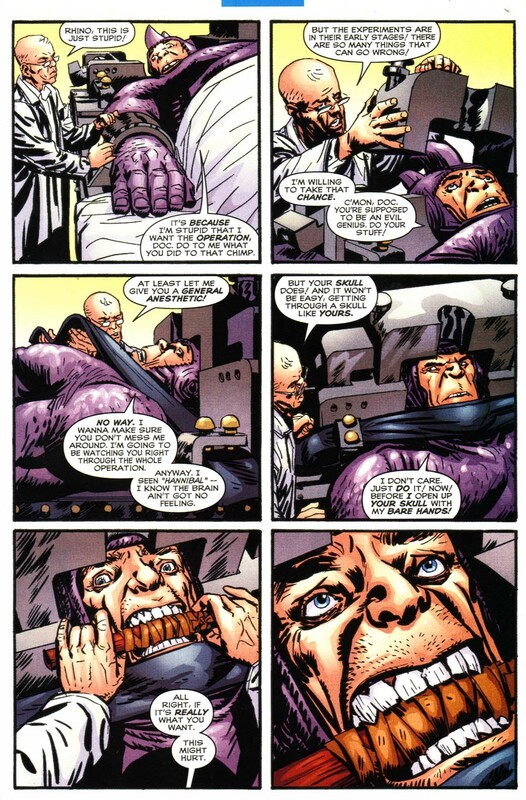 The twist is that the Kingpin paid off Stella to act a little less intelligent and then break up with Rhino so he could continue to have sole access to that one crooked NY tailor willing to create priceless suits in XXXXXL. 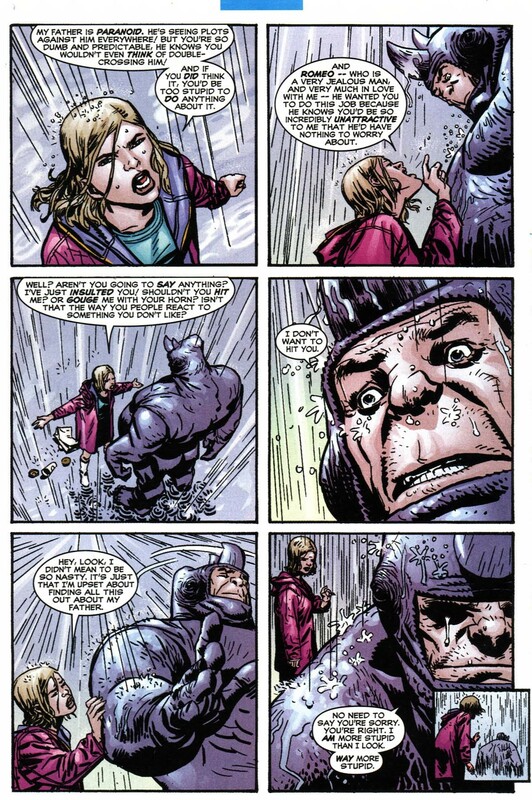 Though still not my favorite Rhino bit. 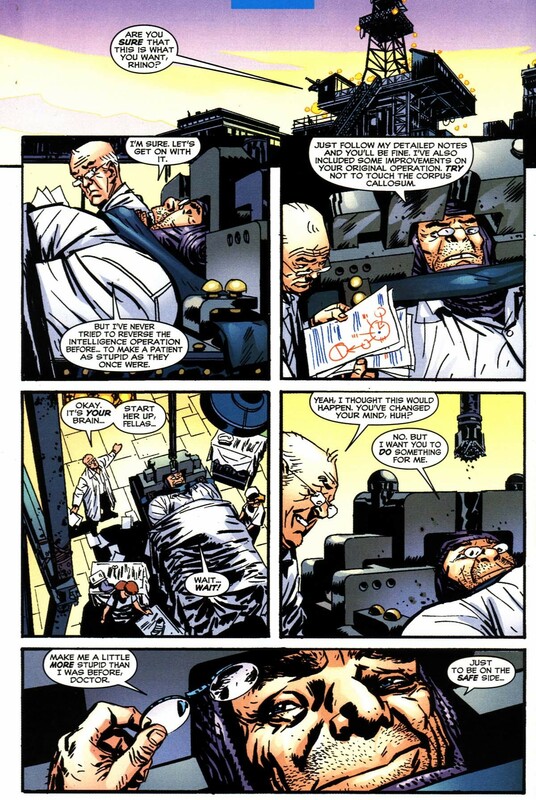 That would be from the Mr. and Mrs. Spider-Man stuff, where he and Peter and family are both at the ER at the same time, and the two just commiserate (without knowing who the other is).